Taking inspiration from the last 10 years of House of Holland, designer Henry Holland’s AW18 collection is a dedication to the legacy of his work; it distills the eclectic ups and downs that have defined this beloved London brand. Vintage sportswear, deconstructed denim, and delicate flowing silhouettes are some of the many influences that defined this varied collection. Amid the giant, oversized puffer jackets, and distressed tailoring, the collection is cohesive and showcases a very contemporary approach to styling with high-waisted belting and a juxtaposition of workwear elements with formal silhouettes. As the collection unfolds through the catwalk models its complexity is truly revealed as it changes from a focus on camouflage, to stripes, to plaid, and all red ensembles. To try and reduce this collection to single parts is pointless, rather the collection must be understood through the context of the 10 year reign of House of Holland. Offering modern and innovative takes on House of Holland favourites, this collection may take inspiration from the past but looks to the future of fashion in showcasing innovation in every piece. With so much to say about this collection, From The Streets breaks down some of our favourite looks. Opening the collection, this look brings together a variety of House of Holland themes while offering an exciting insight into what is in the future for the brand. Vivid red and powder blue makes this piece truly eye-catching while the laced work boots and flowing patterned capris are some of this collection’s essentials. While the shirt and jumper add some formalwear elements, the jacket’s distressed, contrast design truly makes it one of the standouts of the whole collection. With a descriptively simple colour story, this look stays true to Holland’s goal of always offering something inspiring and different. 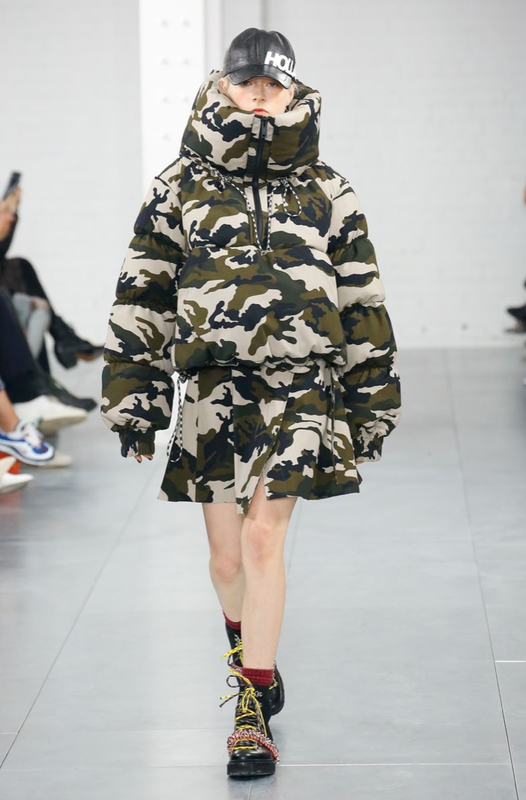 Once again, the puffer jacket trend is inescapable for London Fashion Week AW18 and Holland provides his own input with an extreme oversized fit and camouflage finish. Styled with a matching skirt, this piece shows off a branded cap and work boots for a dramatic street style look. Creating an impressive silhouette through the high neck cut and immense padded body, this look shows off a modern interpretation of Holland’s love of distinctive patterns. Perhaps a little predictable considering the puffer trend this season, this piece none the less shows that puffer jackets remain a must-have for the future of street style. One of the defining looks of this collection, this outfit is one of the many modified formalwear pieces within the collection. Showing off a stunning plaid pattern and high waisted fastening with industrial detailing, this piece defines House of Holland’s exciting style. The reds and blues of the collection are embodied within this piece and is brilliantly styled for a fitted yet effortless finish. Pattern, proportion, and texture all work together to create this look and perfectly sum up the mantra of Henry Holland: that fashion should never be boring.